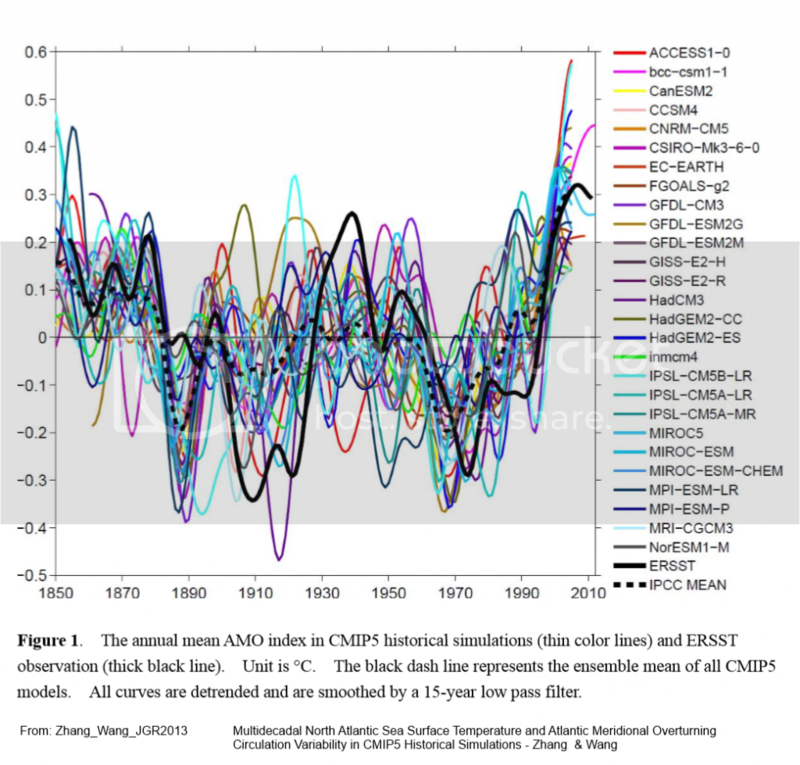 A relationship between Sea Ice Anomalies, SSTs, and the ENSO? | Watts Up With That? A relationship between Sea Ice Anomalies, SSTs, and the ENSO? Abstract: The change in the relationship between the hemispheric sea ice anomalies appears to have a sinusoidal nature with a wavelength that is a function of North Atlantic and North Pacific sea surface temperature oscillations. There is also a repeating signal observed in both oceans going back at least 100 years. The pattern of this signal appears to be correlated with the sea ice area in both hemispheres and the ENSO. With only a cursory look at the sea ice anomaly trends in Figure 1, it might be surmised that that the Northern and Southern Hemisphere (“NH” and “SH” respectively) anomalies are negatively correlated; that is as the anomaly in one hemisphere increases, the anomaly tends to decrease in the other. Figure 1 – Northern and Southern Hemisphere sea ice anomalies over time (Cryosphere Today / Arctic Climate Research at the University of Illinois). Simply plotting the relationship between the Northern and Southern Hemisphere sea ice anomalies won’t do much to change a perception of a negative correlation. As illustrated in Figure 2, overall it is negative (r^2 = 0.08). Notwithstanding, it appears that an inverse relationship does not accurately characterize the data, and in fact there seems to be a different, and much more interesting, relationship hidden just below the surface as Figures 2 and 3 begin to suggest. Figure 2 – plot of the NH vs. SH sea ice anomalies and the trend across all data points. Color coding by year suggests that the relationship may have changed significantly over the duration of the satellite record. Figure 3 – the NH vs. SH sea ice anomalies by calendar year. Black lines are linear best-fit (same color coding as in Figure 2). 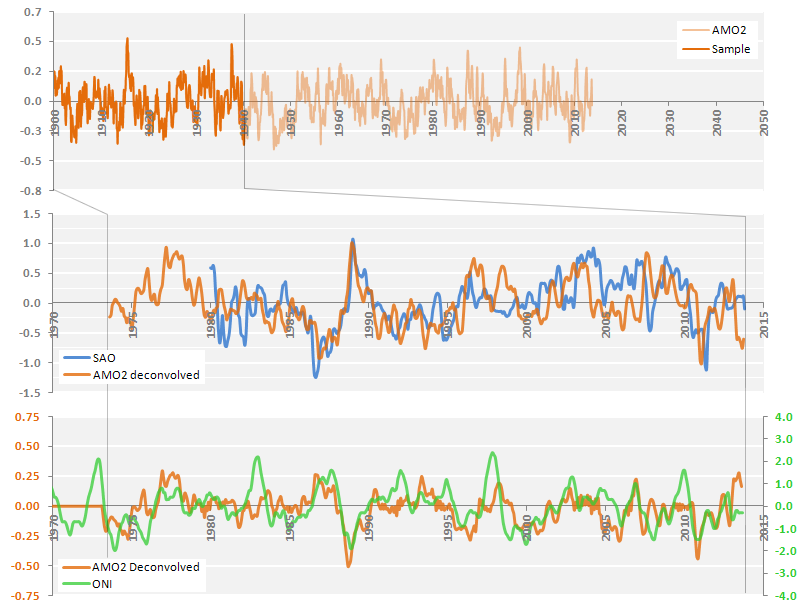 Figure 3 shows that the relationship between the NH and SH sea ice anomalies has changed meaningfully over time in both sign and magnitude. To study how this relationship varies continuously rather than in arbitrary discrete windows, I calculated the slopes of the best-fit lines (in the least squares sense) beginning with the most recent 356 days of the record (2014.0137 – 2013.0165). I then slid the calculation window backwards across the entire sea ice anomaly record one day at a time, stopping at the final 356 days of the record. This produces a 34 year long daily record of the trailing 365 day relationships between the NH and SH sea ice anomalies (Figure 4). Any point in the series represents the sign and magnitude of the relationship between the NH and SH sea ice anomalies for the preceding 365 days. I named this index the Sea ice Anomaly Oscillation (the “SAO”). Figure 4 – the SAO compared to the NH and SH sea ice anomalies. When the SAO is positive, the hemispheric sea ice anomalies generally moved in the same direction (either up or down) over the previous 365 days, and when the index is negative, they generally moved in opposite directions. 49.5% of the series is positive. The SAO appears to oscillate with an approximately 32 year period that is almost exactly half that of the AMO (Figures 6 and 7). I also compared the SAO to a similar SST index for the Pacific: the mean North Pacific SST anomaly (20N-65N, 100W-100E) with the linear trend removed. 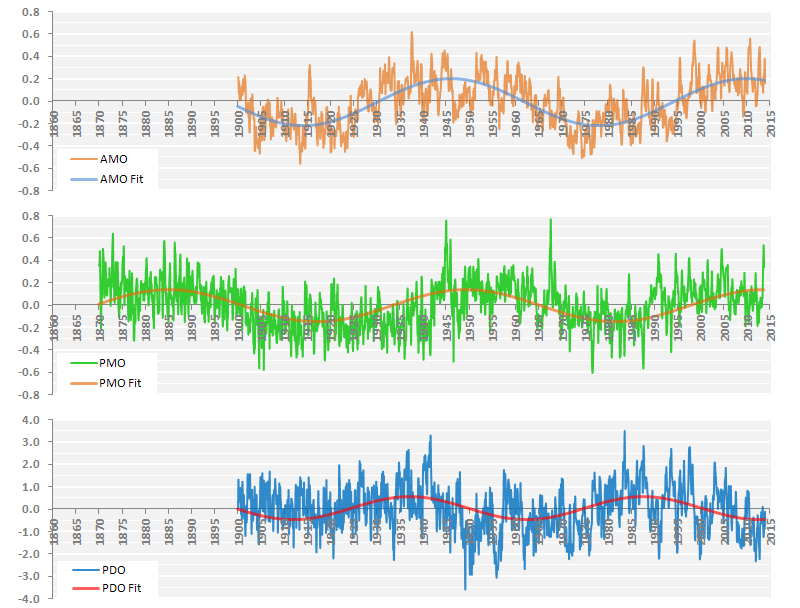 I will refer to this index as the Pacific Multidecadal Oscillation (the “PMO”). The roughly 64 year wavelength of the PMO is almost identical to the AMO with the two little more than 3 years out of phase. 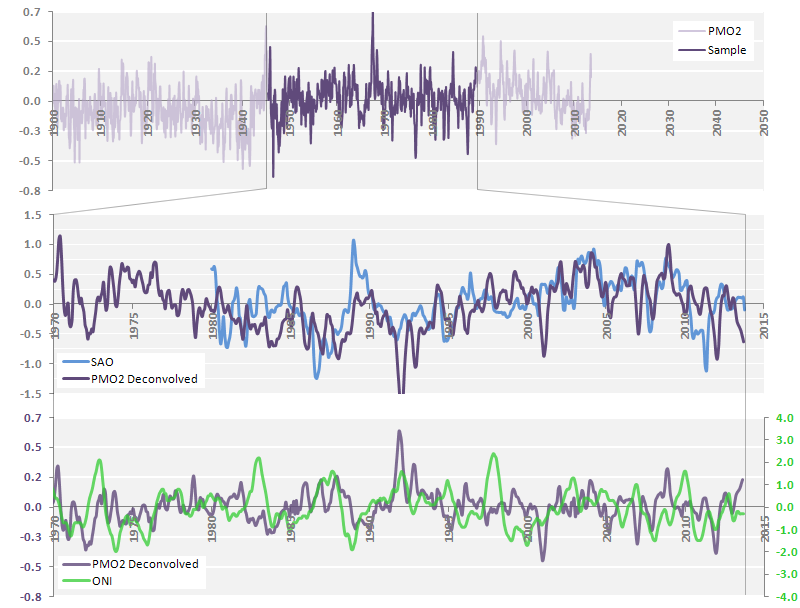 Figure 5 – the approximately 32 year SAO oscillation period. The SAO appears to be directly related to the AMO and PMO. SAO minimums and maximums occur at approximately the intersection of the AMO and PMO and the maximum separation of the AMO and PMO respectively. Zero crossings occur at approximately 1) the intersections of the AMO and inverted PMO, and 2) the maximum separation of the AMO and inverted PMO. A relationship, if any, between the SAO and the PDO is not readily apparent (Figure 6). Figure 6 – the SAO trend compared to the AMO, PMO (top), inverted PMO (middle), and PDO (bottom) trends. When I first plotted the SAO, I noticed it looked similar to any of the standard ENSO indexes such as the Oceanic Nino Index (“ONI”) or the Multivariate ENSO Index (“MEI”). In fact, simply inverting the SAO at its zero crossings matches it up to either of these indexes tantalizingly well (Figure 7). While studying the AMO and PMO, I noticed that after removing the main sine components, the residuals (which I will refer to as the “AMO2” and “PMO2” respectively) also had a sinusoidal nature, and that they appeared to be carrying information; the general pattern of the SAO appears to repeat multiple times across both series. To deconvolve the relevant segments into the SAO, I simply inverted them at the fitted SAO zero crossings and then smoothed with a 3-month centered SMA filter. Deconvolving the AMO2 and PMO2 signals into an ENSO proxy was somewhat of a bigger challenge primarily because the data is fairly noisy (as should probably be expected given the nature of the data). I ended up building a model to deconvolve the signal and then optimized for a frequency solution using the ONI as a reference to minimize variance against. The optimized AMO2 and PMO2 frequencies were 0.1% and 1.0% different from the sine waves fit with R respectively. Deconvolving involved inverting the signal at the AMO2 and PMO2 zero crossings and at the AMO2-PMO2 intersections. The deconvolved signals were smoothed with a 3-month centered SMA filter. The r^2 of the deconvolved AMO signal segment in Figure 8 compared to the ONI is 0.23 (0.24 MEI and 0.20 vs. NINO3.4). This doesn’t sound too bad when I consider that the AMO is calculated from the average of the entire North Atlantic and that the data used goes back between 74 and 114 years. I ran several other AMO2 and PMO2 segments through the same algorithm and used the same frequencies, and while they didn’t correlate to the ENSO record nearly as well as the first segment I extracted from the AMO2, visually there were still many similarities. One example of a segment from the PMO2 is given in Figure 9. Figure 8 – a segment (1900 – 1940.3) taken from the AMO2, shifted forwards in time to the present, and deconvolved into an SAO proxy (middle, r^2 = 0.17) and into an ENSO index proxy (bottom), shown here compared to the ONI (r^2 = 0.23). Figure 9 – a segment (1945.5-1989.3) taken from the PMO2, shifted forwards in time to the present, and deconvolved into an SAO proxy (middle, r^2 = 0.24) and into an ENSO index proxy (bottom), shown here compared to the ONI (r^2 = 0.02). If these relationship hold, it appears that the next couple decades will see a generally warmer Nino3.4 region. With respect to the sea ice anomalies, I’m not sure how to translate the SAO forecast into km^2 or changes in the gap between the hemispheres – or if it is even possible to do so for that matter. It would appear however that the anomalies will be moving in generally opposite directions for the better part of the next two decades. Figure 10 – forecast ONI and SAO based on the AMO2 signal post-June 1940. These observations would seem to further call into question the idea that GHGs are the driving force behind the contraction of Arctic sea ice area over the past few decades. If repeating SST patterns can predict the relationship between the hemispheric sea ice anomalies more than 100 years later with the resolution illustrated in Figures 8 and 9 (middle charts), which is the more likely cause: GHGs or natural cycles? Likewise, perhaps winds do explain much of the recent Antarctic sea ice expansion as several recent journal articles have suggested (http://journals.ametsoc.org/doi/abs/10.1175/JCLI-D-12-00139.1 and http://www.nature.com/ngeo/journal/v5/n12/full/ngeo1627.html), but if so, this would suggest such winds are part of processes set in motion a long time ago – as was whatever mechanism has caused the corresponding contraction in the Arctic. Table 1 – Curve fit constants. Figure 11 – AMO, PMO, and PDO curves as fit. The SAO is shown in Figure 5. The r^2 of the individual points of the SAO are fairly low. More than half are 0.07 or less. Notwithstanding, over 80% of the results are statistically significant at the 0.05 level and almost 73% at the 0.01 level. Of course, many of the points that are not statistically significant are where the SAO is zero (thus r^2 is also zero), and you would not expect the results to be significant. Figure 12 – SAO Index r^2 and Sig. F. Red lines identify the points of the SAO that are not statistically significant at the 0.05 level. What a fantastic paper! Can someone peer review this essay? It’s clear, terse, documented, and everything a short communication should be. This website is turning into a journal, of sorts. And for those of us on our lunch-hour, who don’t have the time or intelligence to decipher, what will happen to the Arctic in the next 10 years or so? Sorry, I know it’s all there somewhere. While interesting, I see a number of issues here. I would be careful about saying too much about ice extent/area/volume/concentration between the two poles. There are several differences between them, including circumpolar waves in one and not the other, large topography and geographic differences, and perpendicular incoming and outgoing currents in one but not the other. That is not to say they are not both affected by ENSO oscillations. It is just that ENSO events may set up cause and effects showing up in sea ice data that may be quite different between the poles, though may result from time to time in the seesaw currently evident in the sea ice data. I would also be careful interpreting your data using statistical significant difference algorithms. You have heavily manipulated your data. Any errors will be magnified thus producing spurious results in terms of significance. Not to mention the number of variables (see third sentence) you have in the data would require significant amounts of raw data to decrease your errors. What relation/difference is there between your PMO. and the PDO? Are they one and the same? I’ve thought for a while, as do others that I’ve read, the climate operates as multiple loosely coupled charge-pump oscillators. Waters at the equator warm, winds and pressure zones develop which then push that warm water into other areas of each ocean. At some point the replacement of warm water with cold, an increase of clouds, or ? stop the pumping action, resetting into the charge mode. Since the tropical area is different for each ocean, they would have different time constants. I see the melting of Arctic ice as a self regulating system, where warm water melts the ice, and large exposed warm ocean waters radiate more energy into space than they absorb. Each of these major events change the state of the collective system. I could see that the period of the oscillators change as the speed of the warming increases or decreases due to solar output and possibly Co2. This will be telltale of the energy accumulation of the system. The problem with decoding this complex system, we just don’t have enough good data for a long enough period of time, we have bits and pieces. 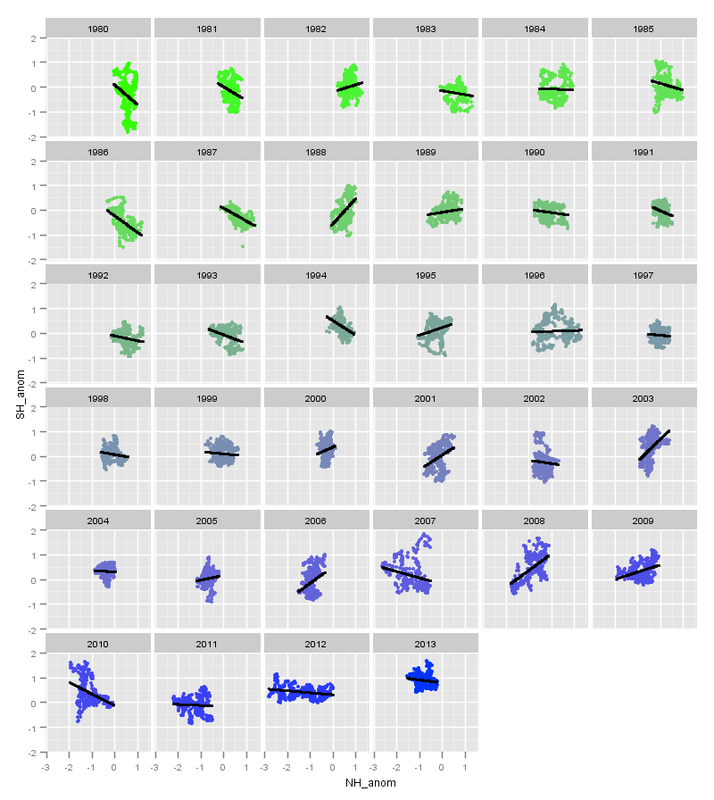 Oh come on, the NHvsSH scatterplots are indeterminate at best. The distributions on the yearly plots do not lend themselves to linear fits. On most of them you could fit in almost any direction and get an answer – doesn’t mean it is right. “best fit” is a misnomer here. The data are very noisy and certainly not near enough to draw the conclusions the author have drawn. I have to agree with Pamela about the manipulation of data and lack of data to give any real confidence. I would also be careful interpreting your data using statistical significant difference algorithms. You have heavily manipulated your data. Any errors will be magnified thus producing spurious results in terms of significance. Not to mention the number of variables (see third sentence) you have in the data would require significant amounts of raw data to decrease your errors. Heavy manipulation? He just did some correlations and some frequency-removal. I think the idea of the essay is that the “moving correlation” between NH sea ice and SH sea ice can be predicted by SSTs and ENSO. It is only human to see connections in nature but i assure you that there is no connection between northern and southern hemisphere sea ice. That is because they are controlled by different physical processes. 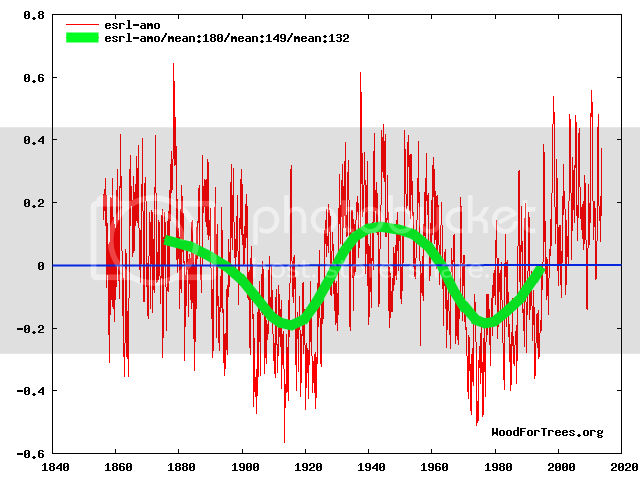 The only well defined oscillation is the ENSO and it has no long-term connections. I look askance on any long-term oscillations that are poorly defined and a clear physical driver is absent, As to the sea ice anomalies, Arctic warming has been reducing sea ice from two to four times faster than climate models predict. Small wonder because all the models have greenhouse warming built into their code while Arctic warming is caused by warm water carried into the Arctic ocean by currents. You simply can’t use greenhouse warming to predict the course of a non-greenhouse warming. Take that away and both temperature curves become identical. It started suddenly at the turn of the twentieth century, after two thousand years of slow, linear cooling. Its likely cause is a rearrangement of the North Atlantic current system that started to carry warm Gulf Stream water into the Arctic Ocean. It paused in mid-century for thirty years, then resumed, and is still going on. Arctic is actually the only part of the world that is still warming while the rest of the world is enjoying a hiatus-pause that is actually a permanent cessation of warming. Natural warming, that is, because greenhouse warming never existed. In the twentieth century there were only two spurts of warming – the first in 1910 raised global temperature by half a degree Celsius, the second in 1999 raised it by a third of a degree Celsius. ENSO does not count because it periodically returns to its base temperature. I’ve got a number of problems right from the beginning. 1) You base your analysis based on the idea of correlation between the hemispheres’ ice extent. But there is no correlation. Figure 2 shows that quite clearly. 2) In figure 3, you attempt to show that the alleged correlation changes over time. The problem is that none of the individual years appear to have any real correlation. Sure you can get a best fit line through the points, but that best fit is still a really lousy fit. 3) Based on the flawed idea of a significant one year correlation, you then come up with figure 5. Since none of the individual data points are meaningful, as described in my point 2, the graph that is made from those points lacks any real meaning. 4) For the sake of the argument, lets say that figure 5 was meaningful. You then fit a sine wave to it, and used that to extrapolate it to 1900 (Figure 6), and use that extrapolation to draw all of your conclusions. Is there really a sine wave? Maybe, but we can’t tell yet. We have at this a point a maximum of one complete cycle on the theoretical, and very noisy, sine wave. 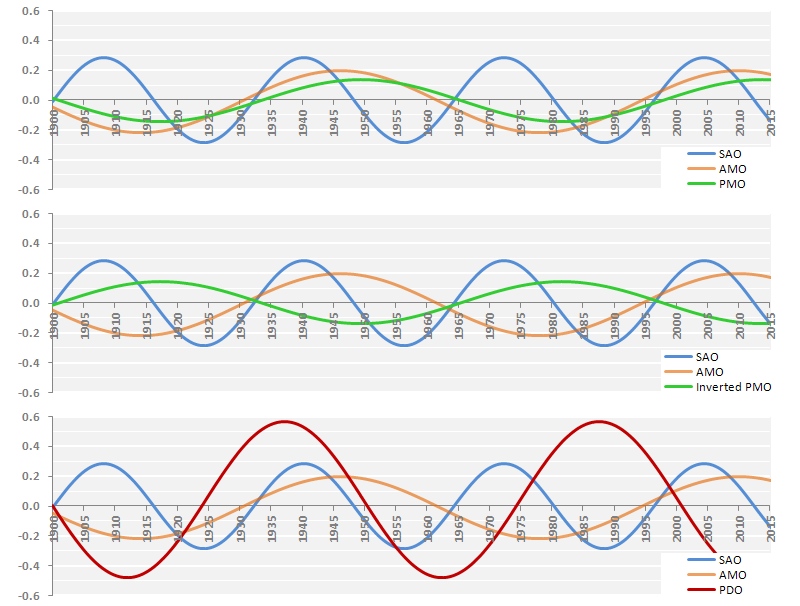 Go back and read some of Willis’ criticisms on curve fitting and then come back and tell how reasonable it is to fit a sine wave to a single cycle. Polar vortex unchanged. 17 km. Joe Bastardi has been saying something very similar for some years but not a bad paper. Isn’t this just a demonstration of the Law of Conservation of Polar Ice? Thanks Graig, very interesting and complex too. Not surprisingly, nature seems to be well-connected! The author concluded in part “These observations would seem to further call into question the idea that GHGs are the driving force behind the contraction of Arctic sea ice area over the past few decades.” A reasonable and appropriately cautious statement. He also said “It would appear however that the anomalies will be moving in generally opposite directions for the better part of the next two decades.” Something of a prediction, but not really a bold one, is it? The current trends in N. and S. graphs support that more or less “by inspection.” I applaud the exercise, and find little to object to in the author’s conclusions. Wiggle matching with an r^2 = 0.08??? Be still, my beating spleen! I’m underwhelmed.There may be something here, but I’m afraid it’s lost in irrelevant numerology. 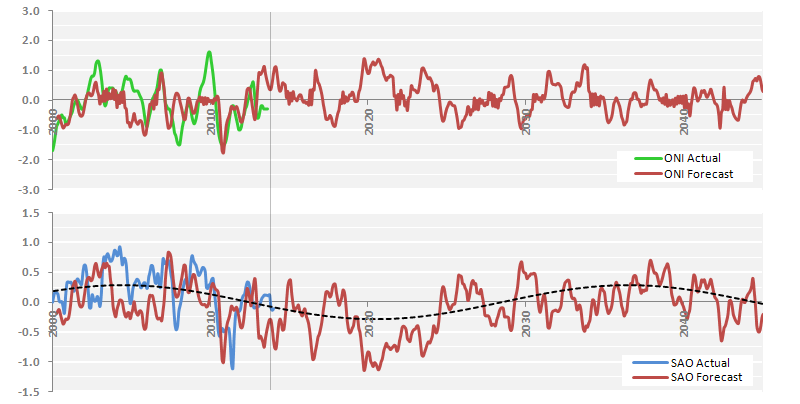 The NS and SH correlation looks to be 0.0 +/- 1.0. Interesting, but it looks like a remedial course in Stats is required. The elephants tail is NOT longer. In fact, simply inverting the SAO at its zero crossings matches it up to either of these indexes tantalizingly well (Figure 7). What does that mean? It looks like you merely multiplied every point in the curve by -1. Take any two independent autoregressive time series over a finite time span and the odds are that they will be correlated. This is explained in the soon to be published book by Kass, Eden and Brown, Analysis of Neural data (here: http://www.springer.com/?SGWID=0-102-24-0-0&searchType=EASY_CDA&queryText=kass%2C+eden%2C+brown&x=0&y=0; the is also available in pdf form from Rob Kass’ website at the Carnegie-Mellon University Statistics Department. I can provide more information if anyone asks, such as page number.) You have taken a bunch of autoregressive time series, and shown that they are correlated, as expected. What you have not done is shown that they are not independent. The sharp rise and fall temperature at a height of 30 km. Please compare with January 2013. Sorry, r square less than 0.5 is rubbish. Try looking at max. temps. Ionizing radiation indicates the area of ​​lowest pressure over the the Arctic Circle. This is a very interesting idea, however, there is one important technical flaw in the method. This is a classic misuse of OLS linear regression that is widespread in many fields of study but especially in climatology. The basic problem is that the maths behind OLS “best fit” assumes and REQUIRES minimal error in the x-variable. This is fine in controlled lab experiment or for a time series where dates are usually accurately known. 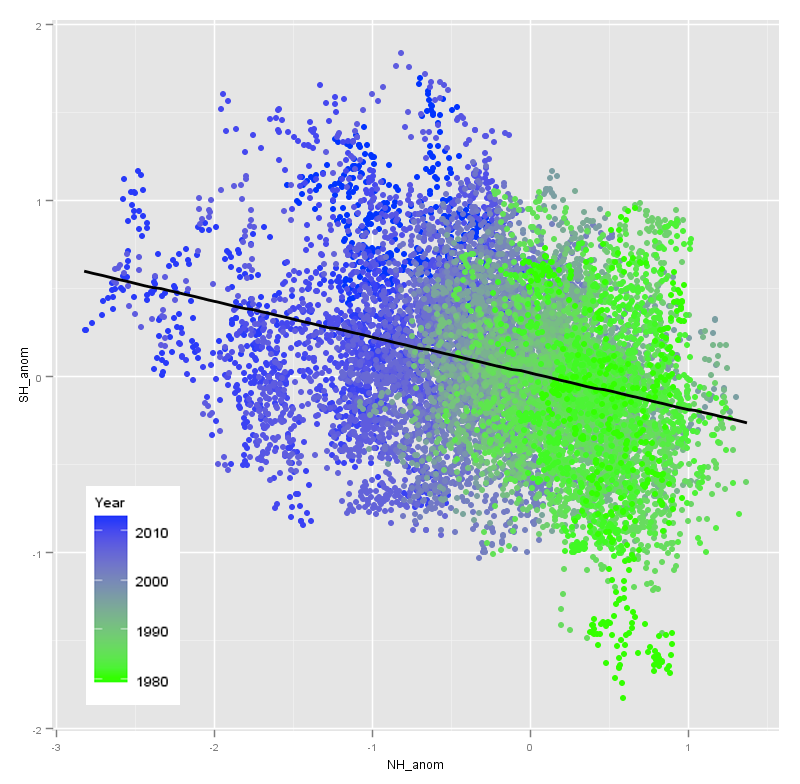 However, it is not correct once you bang two error loaded datasets onto X and Y for a scatter plot. Then there is an effect called ‘ regression dilution ‘ and the slope usually comes out too low. And on this kind of data it can be WAY too low. To see the problem just plot the graph the other way around and do the OLS . The two slopes should have a product of unity : eg 3 in one sence would give 0.33 in the other if they were consistent. Usually you will get something 0.25 and 2.5 , both being lower than the correct value. How much generally depend upon the spead of the data. Here there is a huge spread and the error will be significant. I would highlight 2006 as one year that will give a grossly different value fitted the other way around. A first guess at the true ‘best estimation’ value is to take some middle value of the two slopes or bisect the angle. That would be good enough for this exercise. Since this error will be degrading any relationship which is there it would be well worth rerunning the process and using something like the m_ave shown above. This same error applies to a scatterplot of TOA radiation and surface temperature that is often used to estimate climate scesitivity, real and model based. This ‘matters’ since an erroneously low slope leads to a higher value of CS (which is taken as the inverse of the dRad / dT slope). I’m surprised that this situation is so little discussed in the U.S..
What is this “deconvolution” about ?? Is that a recognised mathematical process ? This basically folds a negative correlation into a positive correlation . What is the result supposed to tell us about the relationship or climate ??? It looks like arbitrary data juggling, if there is some logic behind it, needs to be clearly explained. Sorry, r square less than 0.5 is rubbish. A comment which shows that you have no understanding correlation coefficients and what consitutes a significant result. Looking at figure 1 the term “bipolar seesaw” springs to mind. That assumption is wrong: The Arctic Ocean sea ice expands and contracts between 82 North latitude and 70 north latitude. If it were a symmetric “beanie cap” centered on the north pole, you could easily approximate it as circular cover oscillating between 72 north (14.0 Mkm^2) on March 1, and its modern low point of 3.5 Mkm^2 at 81 north latitude in mid-September. Antarctic sea ice extents also oscillates between a low point of 3.5 Mkm^2 and a recent record-high maximum just under 20.0 Mkm^2, but those similar areas of Antarctic sea ice occur at 70 degrees south latitude at minimum and 59.2 degrees south latitude at maximum. At lower latitudes many thousand kilometers closer to the equator every day of the year, the Antarctic sea ice is much more effective at reflecting solar radiation, or in its absence, the exposed open ocean water is much more effective at absorbing available solar radiation than the Arctic sea ice. No , it’s a ratio, so if Arctic ice moves 4 times faster it will just scale the graph. Such a position of the polar vortex will cause flooding in the UK. All oceanic and solar metrics seem to point to 2030 being much cooler than now. In literature, there is already a term for this: Bipolar seesaw. The Arctic sea ice has undergone quite a change over the last week. Today,s NSIDC shows that the trend has now moved below the -2 sd line, and from appearances it is about to nosedive. The DMI shows a strong upswing in Arctic temps close to 260K. The temps have risen 10K over the last 3 days. I would imagine that there will be some chatter from the warmists side when they notice this. Antarctica sea ice has also slumped over the last 3 days, which has brought the trend line back down to the +2 sd line. This is probably due to the approaching minimum. I had thought that the SH sea ice was going to maintain it,s high anomaly level, but it seems that my thoughts were wrong in that regard. The additional data point from 1964, recovered from old satellite data, supports that Arctic/Antarctic sea saw well (Sep 1964, Antarctic 19.7 mill km2 (bit higher than current “record highs”, ), Arctic 6.9 mill km2 (much smaller than thought). This data point is particularly important, because all the the satellite record is AMO positive and only the last few years PDO negative. And the second main driver of Arctic sea ice melt is also not CO2. 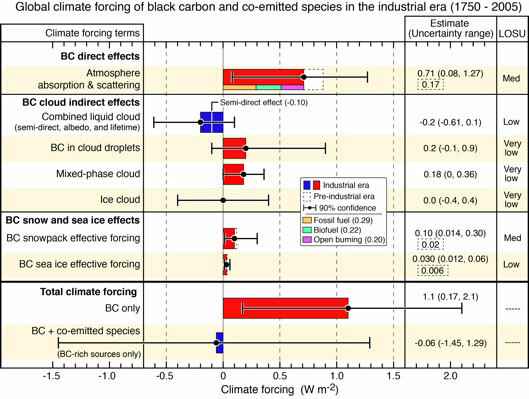 That sums up to black cabon having about 3 times higher forcing on Arctic ice than CO2. Fantastic, brilliant paper! True objective data analyses. More importantly, there is no need for any “CO2-related warming” to explain any of the temperature trends since 1850: global warming problem solved, move on! Taking JDNs comment ( the first for thos post) , perhaps establishing an on line journal for such papers might be the way to go. A not for profit public journal backed by a proper peer review process ( i.e. not pal review) with a separate peer review page for any paper that gets published. Some of the commercial journals have utterly disgraced themselves over the past decade or so in this field particularly and simply cannot be trusted. It would not be perfect of course but wtf, why not. It seems reasonable to suggest that trends in Arctic and Antarctic ice move in and out phase with each other due to the different ocean distributions in each hemisphere. The underlying driver of change would still, in my view, be solar effects on global cloudiness altering the amount of energy able to enter the global oceans but the Arctic and Antarctic ice responses would be on differing timescales which would indeed move in and out of phase. So, a single driver could indeed produce the system response which the author suggests. Curve fitting! It’s not just for breakfast anymore! Craig: You can get much the same information without doing a curve fit at all. If you run a Gaussian or similar filter with a 15 year low pass corner the same (or similar) cycle will pop out of the data without any other work being required. Please also remember that Judith Curry’s Stadium Wave paper has ~60 year cycles all over it. See Figs 7 though 10. They are all connected through the Meridional Overturning Circulation (MOC). As it speeds up and slows down it drives the other oscillations. And this from Zhang and Wang 2013 about how badly the models do in all of this. In reply to Mod: Quote “The roughly 64 year wavelength of the PMO is almost identical to the AMO with the two little more than 3 years out of phase. 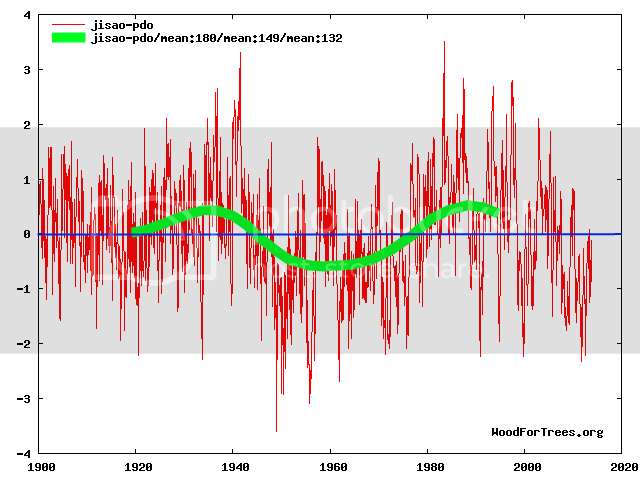 Figure 5 – the approximately 32 year SAO oscillation period.” Hence, my post should read “yes you read that correctly; that’s half of the PMO wave length and that of the SOA…” (I forgot to delete “equal to” when I edited that sentence from period to wave length) sorry about that and thanks for bringing it to our attention! Craig: Low pass on the AMO says it is there also. I still can’t get past Figure 2. When you cross-plot two time series, the slope of the “line” represents the amplitude required to convert one time series into the other. Any correlation (positive or negative) can be seen visually as the narrowness of the graph. A straight line demonstrates high correlation while a “shot-gun” pattern means no correlation. So you have to ask yourself if Figure 2 looks like a “shot-gun” pattern or a straight line. You also have to ask yourself why you would fit a straight line to a “shot-gun” pattern. Rather than doing a step wise discrete function why not just run a standard 365 day low pass Gaussian filter to do the same thing? That would be a continuous function instead. If you really, really want to do a OLS based continuous function then there are OLS based low pass filters that will do a better job also. Well as we have both the Cold flow down over the USA and the Storms tracking over the UK we seem to be neither one nor the other at present. Ulryk Lyons what about this? Me, I would have thought that the pattern of Ice flow in the last few days was more likely to be responsible for that. for the history. Notice how the Northward push of the ice from the East/South is responsible for the ice edge failing to track that open sea historical boundary? Instantaneous figures can easily be misleading. I think we will have to wait a few weeks to see if the catastrophe you pose will actually occur. The figures are not instantaneous, the current sea ice extent graph goes up to around the 11th Feb. And I’m not posing any catastrophe, merely showing that the ice extent has already dropped. The Bering Straits ice is very low and has been for some time, if it stays that way for much longer the Pacific end of the Arctic Ocean is likely to melt rather rapidly. Also note the DMI temperature record North of 80º, that’s been high for some time. as it gives so much more visualisation of what is happening now. I used to watch this daily t one time but trying to predict what was going to happen next got too frustrating. Now I just watch it occasionally. If you look back through the years, you can see that it is not unusual to see above average temps early in the year. I would expect that warm peak to nosedive soon. The DMI history shows that large drops in temps normally follow large warm spikes. One example to note is the year 2012, which tracked close to where the current graph line is now sitting. Right at the end of February 2012, Arctic sea ice took a very steep upward climb. Whether or not that is about to happen again is hard to say. Although, I noticed that the jet stream looks like it is about to reinstate the ridge in the Pac NE again. The jet streams at both poles are undergoing rapid changes. If you look back through the years, you can see that it is not unusual to see above average temps early in the year. 15ºC above normal is unusual however. I would expect that warm peak to nosedive soon. The DMI history shows that large drops in temps normally follow large warm spikes. One example to note is the year 2012, which tracked close to where the current graph line is now sitting. It doesn’t look very close to the current year. Right at the end of February 2012, Arctic sea ice took a very steep upward climb. Whether or not that is about to happen again is hard to say. Although, I noticed that the jet stream looks like it is about to reinstate the ridge in the Pac NE again. The jet streams at both poles are undergoing rapid changes. There’s certainly plenty of room for growth since the SIA is 1,350,000 km^2 below normal at present.